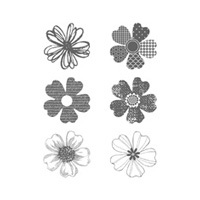 Pink and Dotty: Flower Shop Stamp Set & Petite Petals yet again! I love these stamp sets (have you noticed?!) 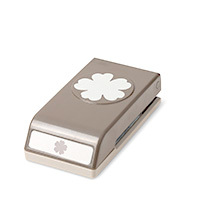 and having the matching punches makes putting a card together really quick and easy. I cased this card from Pinterest and thought the colour combo of Hello Honey, Crisp Cantaloupe and Pistachio Pudding went really well together. I drew the stems on by hand and originally stamped the 'Thank You' sentiment straight onto the card but in my usual haste instead of using my stamp-a-ma-jig to line up the sentiment, I stamped it freehand and it ended up wonky. I punched out another sentiment to cover up my mistake. 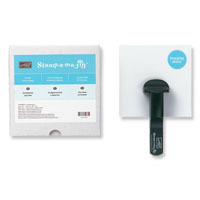 If you don't know what a stamp-a-ma-jig is, it makes it easy to line up any stamp you have and put it exactly where you want it on your card. 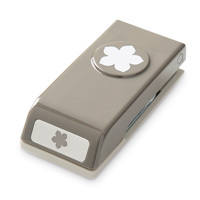 I use it an awful lot as I am not great at stamping things straight! I have included a link to it in my shop below.